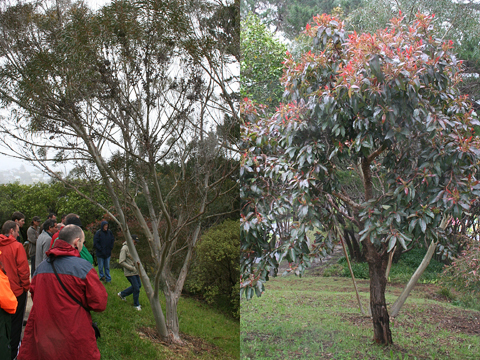 In an effort to bolster our ability to identify some of New Zealand’s most widespread and commonly cultivated trees, Leon Perrie, Curator of Botany and I attended a workshop for identifying Eucalyptus, Corymbia and Pinus species this month. 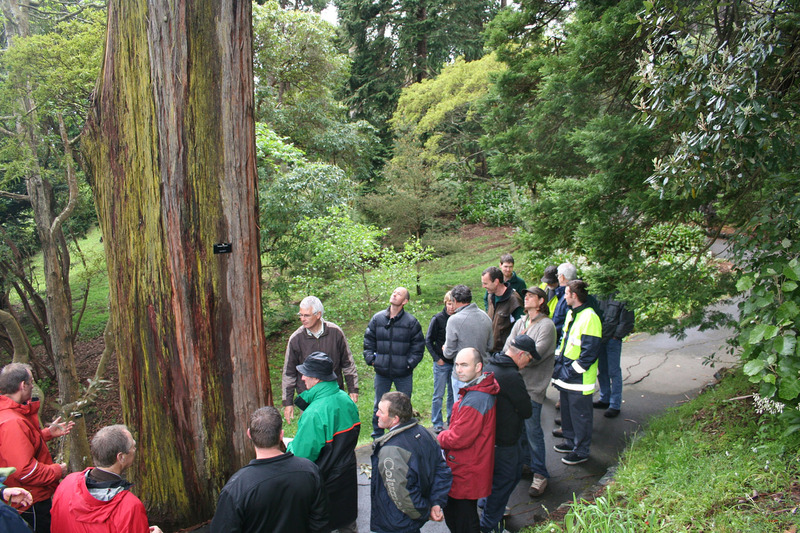 Part of our group gathers as Chris introduces a Eucalyptus species in the Wellington Botanical Gardens grounds. Photo: Antony Kusabs, Te Papa. The workshop was presented by Chris Ecroyd, a long standing member of New Zealand’s botanical community who worked as Curator of New Zealand’s Forest Research Institute Herbarium (NZFRI) at Scion NewZealand, before retiring last year. The workshop was also supported by Scion and Wellington City Council. Eucalyptus and Corymbia are part of the family Myrtaceae. Commonly known members of this family native to New Zealand include rata and pohutukawa (Metrosideros species), kanuka (Kunzea species) and manuka (Leptospermum scoparium). However the Australian members of the Myrtaceae family are much more difficult to tell apart, principally because there are so many of them. Eucalyptus stricta (left) and Corymbia ficifolia (right). Photos: Antony Kusabs, Te Papa. Mallee is the term used to describe a gum that is a shrub or tree less than 10m in height and is multi-stemmed from ground level. We learnt that all mallees are in the Eucalyptus genus, like Eucalyptus stricta above, although these would be rare or non-existent outside gardens in New Zealand. Chris presented tips for collecting good specimens, with mature seed capsules (for Eucalyptus and Corymbia) and mature cones (Pinus) being the best (but not only) material to collect to aid identification. New knowledge for us was that specimens of Pinus are best collected in mid-winter when winter resting buds are present. 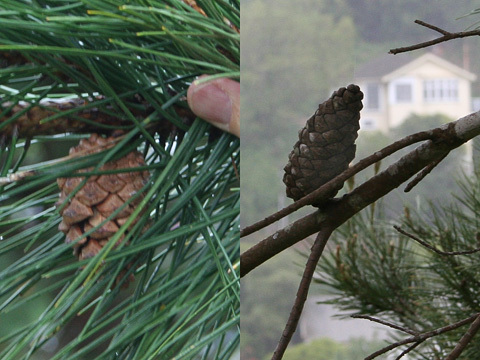 It’s also important to collect open and closed pine cones, if possible, and note direction of growth on the branch and whether or not they are retained on the tree after maturing. Discipline with note taking is important when collecting any specimen and these genera are no exception. It’s important to try to remember to note bark colour, texture and the general tree habit, among other things. The relatively smaller cones of Pinus nigra (left) and the cones of Pinus halepensis (right) pointing back along the stem. Photos: Antony Kusabs, Te Papa. We were also taught characteristics used to split each genera into sub-groups and introduced to computer-based, interactive keys for both Eucalyptus and Pinus. Interactive keys are becoming a more widespread tool for identifying a number of genera. 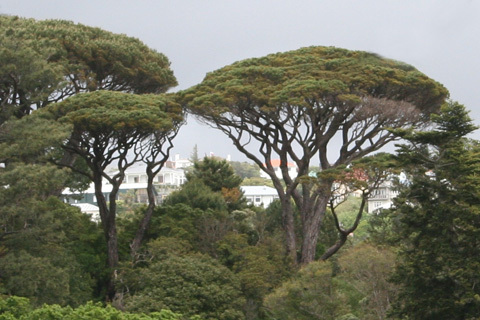 The EUCLID software has to be purchased, but the key to cultivated pines in New Zealand is freely available at key to cultivated pines. Ensure that you have ‘pop-ups’ enabled on your computer and that you install version Java Virtual Machine v1.4.2 or later. 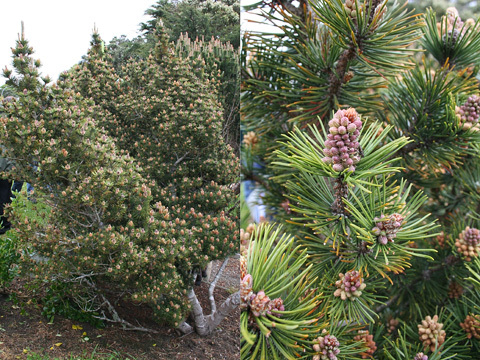 Shrub-forming Pinus mugo exhibiting male cones. A naturalised plant in New Zealand’s high country, as is Pinus contorta with which it is sometimes confused. Photos: Antony Kusabs, Te Papa. The distinctive canopy shape of Pinus pinea. Photo: Antony Kusabs, Te Papa. The identification skills we picked up at the workshop will enable us to develop the collection of these genera within Te Papa’s herbarium (WELT). At WELT we are interested in collecting cultivated plants as well as native plants and have a responsibility, as part of New Zealand’s herbaria community, to collect representatives of all known cultivated species within the central New Zealand region. This group still requires significant development at WELT. Thanks to Jean-Claude Stahl, Te Papa for editing these images.